QUANTIFOIL is a perforated support foil with pre-defined hole size, shape and arrangement. It has advantages in electron microscopy (EM) or low-energy electron point source (LEEPS) microscopy when compared with conventional holey film. QUANTIFOIL is offered with circular and square, orthogonal arranged holes. Films with different hole sizes and bar widths are available. Carbon is the standard material that makes the foil. QUANTIFOIL is a superior quality of holey carbon film, which facilitates the use of automation in TEM. (e.g. The National Resource for Automated Molecular Microscopy, at the Scripps Research Institute, has developed a system, called Leginon, for automatically acquiring images from a transmission electron microscope). The surface properties of QUANTIFOIL holey carbon support film, especially the wetting properties, may have to be adapted according to one's particular requirements. Untreated aging QUANTIFOIL tends to be hydrophobic. Hydrophillicity of the foil can be achieved by glow discharging in residual air or by metal coating. The foil is ~12nm thick and mounted on either copper, nickel or gold grids with either square or round holes of different sizes. Holey films with 2µm round holes are used at magnifications between 30,000x and 40,000x. QUANTIFOIL is generally delivered as a carbon foil; it can be reinforced with plastic film. The standard thickness for the carbon foil is 12nm; other thicknesses between 10 and 25nm can be made upon request. The grids are packed with their coated side toward the center of the grid box. QUANTIFOIL with circular holes is used in cryoelectron tomographic reconstruction. The roundness of the holes is advantageous with respect to the formation of an ice layer of constant thickness. The hole size chosen depends on the magnification used, and on whether or not one wishes to include support film in the image. Assessment of the image quality is easier when foil is included in the picture, because the power spectrum of a foil is stronger than that of unsupported ice. Hole size is 0.6 µm. Space between holes is 1 µm. Center to center is 1.6 µm (hole size may be as large as 1 µm). Hole size is 1 µm. Space between holes is 2 µm. Center to center is 3 µm. May be preferred over R 1.2/1.3, when an increased tolerance with respect to the position of beam, and a larger beam diameter are desired, such as in the case of automated image aquisition. A foil with ~1.2 µm circular holes and a spacing of ~1.3 µm between the holes. This type is used at magnifications around 50,000x. Hole size is 1.2 µm. Space between holes is 20 µm. Center to center is 21.2 µm. Has more open area than R 2/2. It is used when focusing is carried out on the edge of a hole burnt in the ice in a neighboring hole instead of on the foil adjacent to the hole. Holey films with 2 µm circular holes are used at magnifications between 30,000x and 40,000x. May be preferred over R 2/2, when an increased tolerance with respect to the position of beam, and a larger beam diameter are desired, such as in the case of automated image acquisition. Hole size is 3 µm. Space between holes is 3 µm. Center to center is 6 µm. Hole size is 3 µm. Space between holes is 5 µm. Center to center is 8 µm. May be preferred over foils with smaller holes if the carbon film should be outside the frame of the image. This option can be desirable in the case of extended objects, such as filamentous objects, for example. Hole size is 5 µm. Space between holes is 10 µm. Center to center is 15 µm. Hole size is 5 µm. Space between holes is 20 µm. Center to center is 25 µm. Hole size is 6 µm. Space between holes is 6.5 µm. Center to center is 12.5 µm. Hole size is 6 µm. Space between holes is 100 µm. Center to center is 106 µm. Hole size is 10 µm. Space between holes is 5 µm. Center to center is 15 µm. Hole size is 10 µm. Space between holes is 10 µm. Center to center is 20 µm. Hole size is 10 µm. Space between holes is 20 µm. Center to center is 30 µm. Hole size is 17.5 µm. Space between holes is 5 µm. Center to center is 22.5 µm. QUANTIFOIL with square holes and relatively narrow bars can be used in electron microscopy to support a thin carbon film, which by itself is too fragile to span a grid square. Alternatively, this holey film can directly support an object larger than the holes. Constitutes an optimum between a maximum of open area on the one hand, and mechanical stability on the other hand. Hole size is 35 µm. Space between holes is 5 µm. Center to center is 40 µm. Hole size is 35 µm. Space between holes is 10 µm. Center to center is 45 µm. Is a holey film, in which a pattern of various hole sizes, shapes and arrangements is repeated. In addition to circular holes, the pattern includes oval-shaped ones which appear round at high tilt angles (~70°). The diameters of the round holes are about 1, 1.4, and 2 µm, and the bar widths range from 0.5 to 4 µm. The oval holes in the foil have a dimension of 8 x 2 µm and 4 x 1 µm. This type of QUANTIFOIL is meant for slot grids. It was especially designed for supporting serial thin sections. It offers an optimum between mechanical stability on the one hand and background-free area on the other hand. The foil is thin enough to allow those parts of the sections that lie on the bars to be interpreted.In this way, the information in the sections can be interpreted to the maximum. 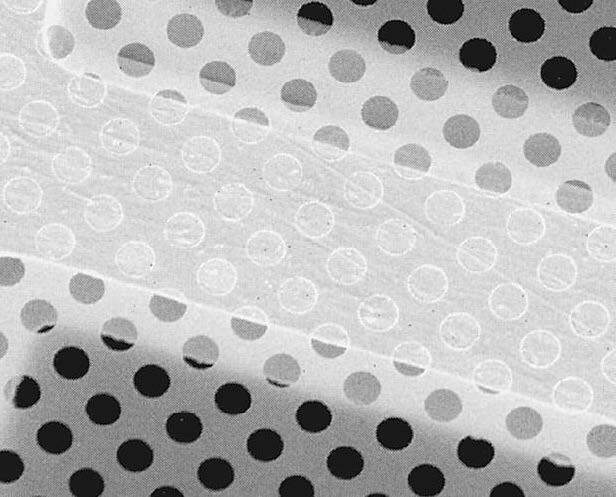 A foil with hole size of 26 µm (diameter of inscribed circle) and a repeating distance of 41 µm, the side length of the holes and the bar width are 15 µm. Maxtaform grids with reference patterns are of the highest consistent quality, with a wide choice to choose from to suit all your particular needs.All other geometries and thicknesses available upon request. Now available with ultrathin continuous carbon. The currently favored and already established material other than carbon is SiO2.